Home » 5M4M » It’s Time For The Ultimate Blog Party! It’s Time For The Ultimate Blog Party! 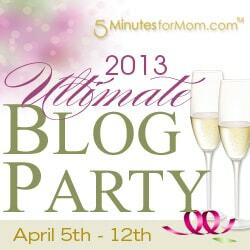 We are all invited to join in the 5 Minutes for Mom Ultimate Blog Party! Have you been by yet? There is a lot going on at this party. There are lots of ways to link up your social media accounts, your blog site and there are tons of prizes to win. It’s fun to hop around the links and connect with old friends and new friends. If you are new to A Renaissance Woman WELCOME to my place! I blog about my lifestyle which includes tech talk, lots of fitness, my family and photos of all sorts. My goal is to inspire, teach or make you laugh with the articles I write! I’m a life long learner so there is always something new to talk about. My top projects that I’m working on right now? Our family is on the 6th step of Dave Ramsey‘s Financial Peace University! He is coming next weekend and I will be going to his new Living a Legacy event. I’m in the process of reading Start by Jon Acuff which is incredibly motivating for people who want to turn their dreams into a reality. If you went to Blissdom then you know exactly what a great speaker he is and how he inspires. Maintaining your body is a workshop series on CreativeLive.com hosted by Kelly Starrett. It’s getting back to basic body mechanics. As I have traveled the road to a more athletic me I have suffered some pretty nasty injuries. This work shop has been a real eye opener! I’ve made the leap last year after five years from blogger to wordpress! It’s been a long daunting task trying to get my blog back into shape! Especially with all the new changes with algorithms and SEO etc… It’s five years worth of material. I’m hoping the switch will be worth it in the end. If you would like to read more about Pamela M. Kramer and connect on more sites click on the hyperlink! Happy blog hopping and enjoy the party.